I love candles, I always have, I love the different scents, I love watching the flame flicker, I always associate candles with relaxation, so when I was offered the chance to review some lovely Christmas candles I said yes, I definitely need the relaxing time whilst its Christmas although I do love Christmas it can be pretty stressful at times. 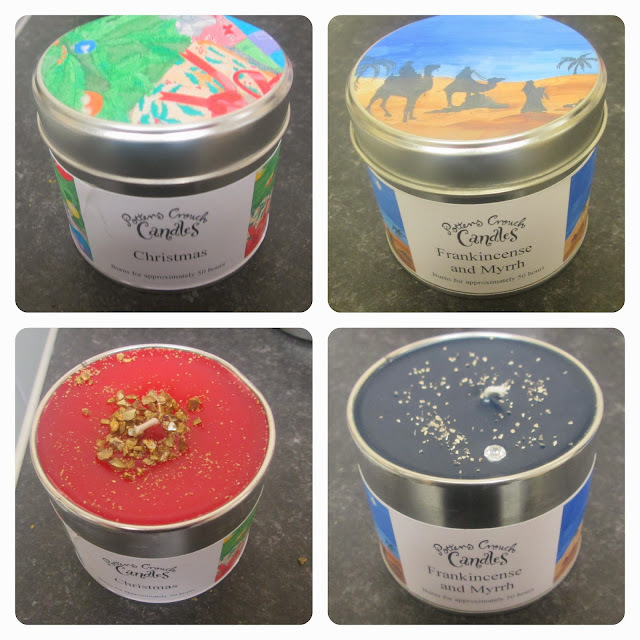 Potter Crouch are based within Hertfordshire, each candle is handmade, hand-labelled and hand-finished I have to say I love the hand made labels and the fact that all of this is done within their barn conversion. Potters Crouch only use the finest ingredients within each of their candles, and each scent is original and created exclusively by themselves. Each candle has an approximated burning time of 50 hours, which is amazing! The candles are priced at great price of £8.50 great for how long they are going to last. I was sent two of there lovely candles to review frankincense and myrrh and Christmas. When the candles arrived they were neatly packaged within a box, and came with three mini chocolates and a leaflet on how to make the most of your candles. Potters Crouch suggest the first time you burn your candles, you do so until the pool of wax reaches the end of the tin. This increases the burn life of the candle, and allows it to release more fragrance. The first candle that I tried was the Christmas scented candle, as soon as you take the lid off you can smell the scent of it, "wonderful opulent spices blended with pine forests and rich orangey scents" It had a scent of spice about it, I have to say I did like this candle but spices isn't one of my favorite scents its a personal choice, I just favour other scents more than spices. The second candle I tried was the frankincense and myrrrh again with this candle as soon as you take the lid off the sent of the candle oozes out of the tin,"Frankincense is characterized by a balsamic-spicy, slightly lemon, and typical fragrance of incense, with a conifer-like undertone". I love the scent of this candle its a bit of a man scent if I am quite honest its like and aftershave or deodorant its really fresh and lovely I found it really relaxing. Over all I love these products there are so many candles to choose from on there website, they would make a perfect stocking filler or gift for Christmas but they have a candle for every occasion and for all year round there is something everyone. These candles are a great price burn evenly and smell lovely leaving your home with a relaxed aroma I would definitely recommend them.